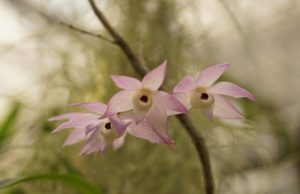 This lovely photo taken by Ben really shows of the delicate beauty of this Dendrobium species from the Himalayas and South East Asia. Its sprays of flowers are produced from old leafless pseudobulbs. It is found in forests from 300m to 1300m which indicates a tolerance of a range of temperatures but we grow in in our Warm Asia section.